You must forgive my long silences because when it rains, it pours. I’ve been pre-occupied with more family things, this time around concerning my grandmother who is, sadly, is no longer with us. She was someone whose life deserves a special mention and more thought, which will be forthcoming, but for now I’ll say this – I’m extremely lucky to have gotten to know her so well in my thirty one years. She made an indelible impact on my life and taught me so much, often without so much as uttering a word. In her last days, she surprised everyone around her, nurses, doctors, our family, with her relentless spirit and strength. We will miss her and we’ll always love her. Needless to say, planning for all this somber business took some time and I’ve been making some frequent trips to Boston. Let’s just say the bus folks know me well by now and greet me with “Nice to see you again so soon!” I wish it were for happier occasions, but I have hope those happier times are coming. Things must start looking up at some point! So while this isn’t a post about my grandmother, she’d have greatly approved of this mushroom pâté. She was a big believer that spending as much time outside as possible was an essential step to good health. And she, herself, was of strong constitution, hardly having any health issues, until the very last years. Back when we lived in Russia, she was always opening windows – even in the midst of the coldest winter days – to air the rooms out. “Provetritsya,” she’d always say, as my mother would rush to close the windows back, afraid I’d catch a cold. A great fan of outside, my grandmother would have been pleased to know that I plan on many a picnic this summer. 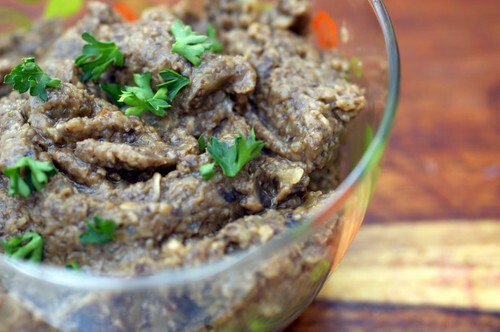 And this mushroom pâté is bound to be a hit at any picnic. 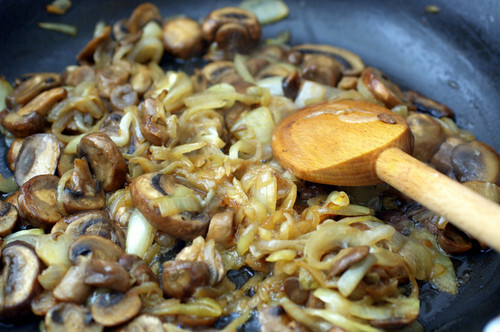 It takes little time to make, requires few ingredients: oil, mushrooms, onions, salt. But while it’s simple to prepare, it comes across as luxurious and quite complex. A spoonful on a cracker or a baguette slice, it will elevate any picnic to a gourmet level. With dishes like this, we all owe it to ourselves to have as many picnics this summer as possible. Not only will it encourage us to savor the summer’s produce (not that mushrooms are an indication of the season) but we can share wonderful meals with friends and family – memories of which will keep us warm through the winter season. The instructions here are approximate because this is not an exact science here. You can adjust proportions to your taste. Heat a few glugs of oil over medium heat in a pan and add the onions when oil is hot and is beginning to sizzle a bit. Sauté the onions until they are translucent and begin to change to pale golden color. At this point, add the mushroom and sauté over medium heat until the mushrooms turn deep brown and reduce in size by about half. Make sure that nothing gets burned and too brown (or it’ll turn bitter) so please be careful to regularly stir and, if necessary, reduce heat to low. When it has cooked down substantially, add 1 tsp of salt and mix well – taste to see if you need more salt and add more if needed. Otherwise, remove from heat and pulse in a food processor until the consistency of pâté. Serve warm or chilled – it works equally well in either state. Although nearly always delicious, mushroom pates are so hard to make photograph well. This one is beautiful. Cooking something so earthy and picnic-like is a sweet way to remember your grandmother. lots of love and good wishes to you. I know times are hard, but when in doubt, grab a drink and give a toast to your grandma. she’d be proud of everything you are doing. I am always looking for quick picnic things that no one else will bring :) This fits the bill. I don’t know you, but can’t help passing my condolences on anyway. It sounds like your grandmother lived a full and vibrant life, and I hope your family is comforted as you remember her. I’m so sorry for your loss. Food is always a comfort, but especially dishes that remind you of people who are no longer here–it’s nice to think that loved ones will always live on through recipes. And this looks like a great one. The recipe, looks super inviting, and I think I know what I’ll be making with all of those mushrooms I bought on Saturday. I am sorry about your grandmother. She sounds wonderful. I love summertime staples that remind you of home. Pesto, is my personal memory-evoker. The smell of basil (in any form) makes me week at the knees. Beautiful photos!